The Shire Hall commemorates those from the district who served in World War One. It was built with funds raised by the District community. On Saturday next at 3 pm. 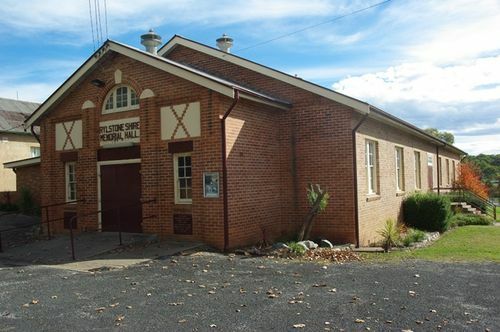 the foundation stone of the Rylstone Shire Memorial Hall will be laid by Senator Cox. Addresses will be delivered by the Shire President (Cr. D. T. Jamison), his colleagues and the clergy. Mr. L. McLachlan will introduce Mrs. Jamison, who is to present Senator Cox with a silver trowel and ask him to proceed with the laying of the stone. A tea tent will be conduced by the Country Women's Association.